A timely book showing how following Jesus frees us from the tyranny of the to-do list. Do you have enough time? Most of us feel pulled in too many directions, never managing to do enough. Matt Fuller liberates us from the drive to do everything; points us to the source of true rest; and sets out a godly framework to help us prioritize, so that we can be productive without being crushed. If you have ever felt the tyranny of a too-long to-do list, or the terror of a too-empty one, spend some precious time reading this book! This wonderfully practical book is packed with careful Biblical reflection and solid Biblical wisdom. It will be a great tonic to many people - both liberating and challenging. I strongly recommend it to the busy Christian. How to make the most of limited time is an issue that faces us all. Matt Fuller’s wise, clear and concise book (ideal for busy people!) shows us how the application of Biblical principles can save us from wasting our time or burning ourselves out. He is wise and practical in the way he tackles the claims of work, home, church and leisure. I am so glad I made time to read this book! For those of us who consider ourselves 'time poor', this is a wonderful book that will help us to rethink and refocus. Matt reminds us that the time we have is God's gift to us to use wisely, without feeling burdened or guilty. The book is full of practical tips and real life examples that enable us the freedom to live Godly lives under the pressures of work, church and family life. Coming up to my holiday this year, I was getting stressed. The list of things to do kept growing, while the time and power and ability to do them all was diminishing with each day. 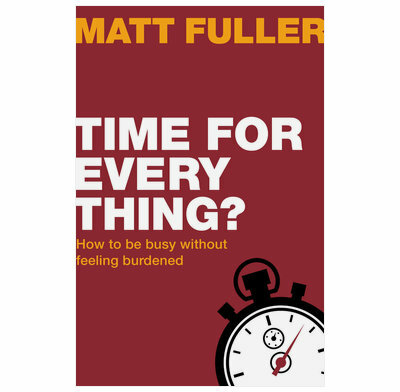 At just the right time, my review copy of Matt Fuller's new book 'Time for Every Thing?' came in the post. The very book for me and my situation. Everyone struggles with how they use their time or how to get the most from the time we have. This may be something you feel you are going through now, or you will face it in the future and even if you think you won’t, it is a great book to know so you can pass on it’s wisdom or give the book to a friend. It is biblical, practical & insightful. It will free you from the burden of the need to do everything!! Take the opportunity to read this, it won’t be a waste of time!! I found this book to be engaging and thought provoking. Underpinned by the Gospel, it challenged preconceptions and offered a framework for evaluating how I could improve my use of time. For example, being reminded that our time is a God given gift to be used in His service, rather than a commodity that's ours to use as we choose, I found very powerful. Thanks to Matt Fuller for finding the time to write it.